Beggars believe a bill licensing their activity will improve their standard of living, but activists warn the proposed law does not solve the root of their problems. Sitthina Kaewkammi, a 46-year-old blind female beggar from Kalasin province, said that the idea of beggar registration under the act was good if it could help her improve her quality of life. ''No one wants to be a beggar if he or she has a better choice,'' she said. ''If registration improves things for me, I will accept it.'' She wanted to run her own lottery shop, but that was not possible as she has no capital to invest. A 29 year-old disabled man who called himself Tee and is a beggar at Soi Ari said he was willing to cooperate if the legislation is passed. He said he earned about 300 baht a day from begging. 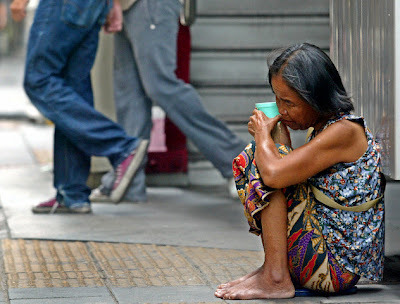 Under the bill, approved by cabinet on Tuesday, local authorities would issue a beggar's licence if the beggar can prove he is underprivileged, disabled, homeless or elderly without care. However, the licensed beggar will be confined to a particular ''working place''. For example, a beggar registered in Phetchaburi would be allowed to work in that province only, not other places such as Bangkok. Many children, and disabled and elderly had been forced to beg despite enactment of a law on human trafficking prevention and suppression since June.